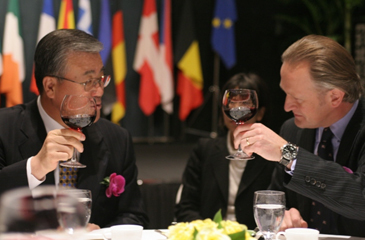 FKI Vice Chairman Cho Kun-Ho (left) with EUCCK Vice President Peter Thewlis at a EUCCK luncheon meeting on Feb. 23, 2006. The most important issue on the agenda at the EU Chamber of Commerce in Korea's (EUCCK) first monthly luncheon for 2006 was the consideration of a Free Trade Agreement between Korea and the European Union. Hosted by vice president of the EUCCK, Mr. Peter Thewlis, the luncheon was held Feb. 23, 2006 at the Hyatt Hotel in Seoul to discuss the proposals for expanding Korea-EU economic cooperation. Also in attendance were the Federation of Korean Industries (FKI) Vice Chairman and CEO, Cho Kun-Ho and ambassadors from the EU member states. During the EUCCK luncheon meeting FKI Vice Chairman Cho delivered a speech under the title of "Proposals for Expanding Korea-EU Economic Cooperation." Among the most important issues presented at the luncheon by Mr. Cho was the FKI's desire to "Seek greater advances in ... economic cooperation through a comprehensive FTA rather than a case-by-case approach." A Free Trade Agreement would provide an "opportunity for Korean companies to access foreign markets" and increase already healthy economic ties between the two countries, said Vice Chairman Cho. The bilateral trade volume between Korea and the EU reached 70.9 billion US dollars last year, making the EU Korea's second largest export market after China and EU foreign investment in Korea now ranks the highest, as of the first quarter of 2005. Exceeding American investment in its cumulative amount and as an export market. Korean investment in the EU is also rapidly increasing and the EU is now Korea's third largest overseas investment market, with many of Korea's largest company's, including Hyundai Motor, LG and Samsung, opening or already operating factories there. Another issue that was highlighted during the luncheon by the FKI's CEO, Mr. Cho, was "the fast rise of India and China, so-called Chindia" which he pointed out was "among the issues of greatest concern at the World Economic Forum in Davos in January." Despite the concerns expressed about the possibility of "Chindia" becoming the world's largest export market and manufacturing base both the EUCCK and the FKI are considering the benefits as well. 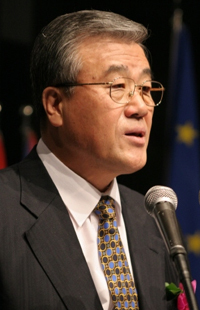 Korea's proximity and reasonably advanced industrial technology increases its ability to serve as an "excellent offshore post connecting the Chinese market to European manufacturers" reasoned Mr. Cho, allowing both Korea and the European Union greater access to the rapidly growing and opening markets developing in China and India. However, the issue of Korea's unionized workers and the power they wield in Korea is a source of concern for many EU member states and companies. The perceived "softness" of the Roh Moo-Hyun government's policies, which appear to favor workers, has left many EU companies and investors unsure about the stability of Korean as an investment opportunity. The 2006 Franco-Korean Friendship year, the FIFA World Cup and the current Winter Olympics are all being seen as events that are sure to strengthen and promote the Korea-EU partnership in the future. Crispin Anderlini, whos serves as Staff Writer & Photojournalist for The Seoul Times, has been working as photojournalist for such publications as South China Morning Post, Shanghai Talk magazine, and SajinYesul for the past two years within S. Korea, China, and Australia.This New Zealand photojournalist graduated from Victoria University in Wellington with a BA in Anthropology.